During your opponent’s turn (Quick Effect): You can banish this card from the GY; excavate the top card of your Deck, and if it is a Normal Trap, Set it to your field. Otherwise, send it to the GY. That Set card can be activated during this turn. If this card is sent to the GY: You can look at 3 cards from the top of your Deck, then place them on the top of the Deck in any order. You can only use each effect of “Absolute King Back Jack” once per turn. 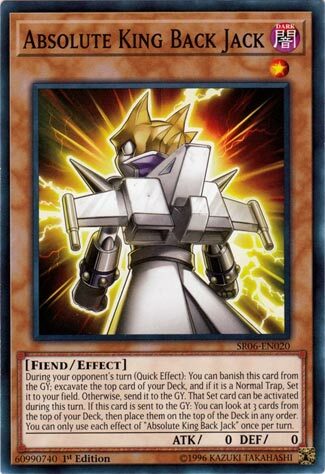 Absolute King Back Jack is a small tech monster for decks that like to know what they have coming up and that run Normal Trap cards. Banish to excavate is easy enough to come by, but the uncertainty of if you’ll end up with the card is a setback. If it is a Normal Trap, you keep it. If the card isn’t, then it hits the grave. This can be a great effect for decks that revolve around getting monsters in the grave like Shaddoll, Burning Abyss, Lightsworn, and Sylvan decks. You are restricted to this effect during your opponents turn, another setback. If it is a Normal Trap, you get to set it and can activate it. If you know you are getting a Normal Trap, you’ll be activating this in the Standby Phase to set up something. The effect of rearranging the top 3 cards on your deck if Absolute King Back Jack hits your grave works well in combo with this cards first effect, but that only works if you have more than one or you bring the one sent to the grave back with a card. While there are plenty of ways to do just that, the card you are getting or sending to the grave has to be good. Lilith may be better at the Normal Trap thing than Back Jack. Absolute King Back Jack is an ok card. He’s a Level 1 Dark Fiend-type monster with 0 Atk and 0 Def. He can certainly be used at one in a Diabolos deck. Why? Because while in your grave you can banish him as a Quick Effect during your opponent’s turn to excavate the top card of your deck. If it’s a Normal Trap you can set it and activate it that turn. If not, it goes to the grave. There are decks that run a lot of Normal Traps. Obviously I’m referring to the Virus Traps in this instance. If he was sent to the grave before using the first effect, he can rearrange the top 3 cards in your deck. He can do that so long as he hits the grave from anywhere, but really you can just set this card and forget it. It might be useful, it might not be. He’s also an Allure target. Yeah, Absolute King Back Jack can be helpful, but not in multiples and not in many decks. If he could set any Trap or if the effects weren’t a hard once per turn, things would be different. Score: 2.5/5 Art: 3/5 Flying straight to the grave? Up next on the list of randomly generated cards is a card with some cool utility, Absolute King Back Jack. Back Jack is a Level 1 DARK Fiend with 0 ATK and DEF. Stats are terrible, but what would I expect from a Level 1? DARK is a great attribute again and Fiend is a solid type. During the opponent’s turn, you can banish Back Jack from the GY to excavate the top card of the deck and if it is a Normal Trap, you set it to your side of the field and it can be activated that turn. Otherwise, the excavated card goes to the GY. The ability to get a Normal Trap from the top of your deck and it being useable that turn is very nice. Paleozoics love this to activate any Trap they excavate, which all of the Paleos are Normal Traps. A Trap Hole or Mirror Force card would also be great cards to excavate for some disruption and protection, along with Torrential Tribute. If Back Jack is sent to the GY, you can look at the top 3 cards of your deck and place them on top of your deck again in any order. Reordering the top of your deck can help his other effect go off easier or prevent you from bricking. Both effects are a hard once per turn to maybe control this a little better, though honestly the second effect might not even need a hard once per turn unless you are shuffling your deck after a search or something. Back Jack is great for Trap heavy decks. Art: 2/5 Robot Jack Atlas is meh.